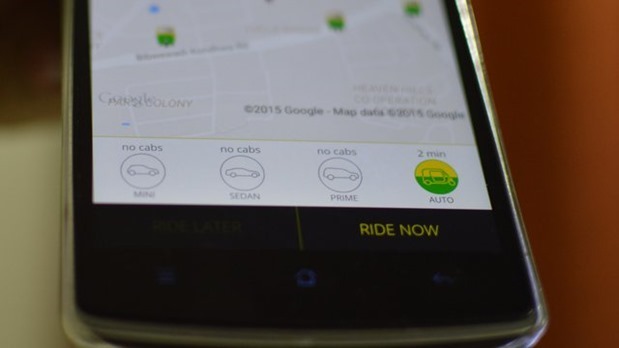 Decoding OLA Cabs Billing Issues - Ola ka Gola! 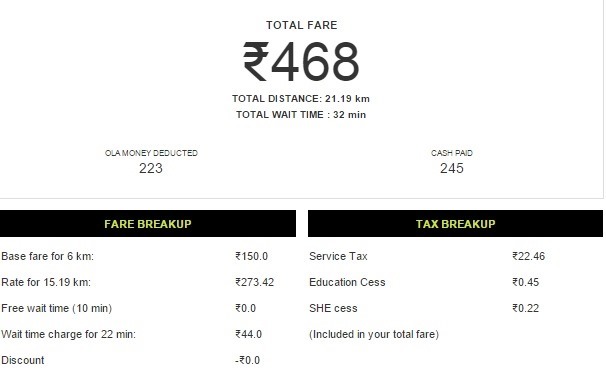 Decoding OLA Cabs Billing Issues – Ola ka Gola! OLA Cabs is by far the biggest car rental service in India and currently commands over 70 percent market share and is operational in over 80 cities in India. OLA has over 40,000 cars registered with them and claims to clock an average of 150000 bookings per day. It has recently raised over USD 400 Million and is valued at USD 3.5 Billion. I would like to share an incident that I encountered recently using OLA Cabs. On 10th May, 2015 I booked an OLA sedan cab from Nahar Amrit Shakti, Chandivali to Century Bazar, Prabhadevi at 11:37 PM using the OLA android mobile App. I was given an ETA of 11:49 PM for cab arrival at the pick-up point. The cab arrived few minutes early. I boarded the cab at approximately 11:49 PM and the journey commenced. The cab dropped me at 12:22 AM outside my home in Network Co-Op Housing Society, Prabhadevi. Total Fare calculated by the OLA app displayed on the driver mobile was Rs. 468. I had Rs. 223 in my OLA wallet which automatically got deducted and the remainder of Rs. 245 was to be settled in cash. I had only Rs. 230 in cash with me at that time. I gave the driver Rs. 230 in cash and asked him if I could pay him the rest by adding Rs. 15 in my OLA wallet. He asked me to add money in the OLA wallet and call the call centre and inform them about the same and ask them to transfer the balance amount to him. At 12:22 AM OLA sent me the invoice CRN81917087 to my email. The invoice contained the breakup summary of the total bill raised. The Total Wait time displayed in the invoice baffled me. It said the Total Wait Time was 32 minutes for my trip that lasted exactly 32 minutes. The funny part is the invoice mentions that my trip commenced at 11:49 PM and the time stamp at which the invoice was generated as 12:22 AM i.e. 32 minutes from the beginning of the trip to the end of the trip. Therefore, I can conclude that the OLA wait time and distance calculation system in place is highly unreliable and inconsistent. While OLA has credited Rs. 44/- the wait time charge of the disputed transaction to my OLA money account and on my request has deducted Rs. 14/- from my OLA money account and credited it to the driver concerned. OLA support claims that the extra wait time charge on my bill was due to a temporary technical glitch without elaborating further on the cause and promised to fix it so that such experience never happens in future. However, I feel OLA should give a detailed explanation with regards to the cause of this technical glitch in their system and how they would ensure that such experience never happens in future. In this article, the author talks about OLA replacing Wait Time charges with Ride Time Charges for Prime in Mumbai. Whereas, they had kept Wait Time Charge intact and not introduced Ride Time Charges to Mini and Sedan. Now, I had booked a Sedan so technically Ride Time Charges were not applicable for my ride. I was to be charged for only wait time beyond 10 minutes. While, my trip was in progress the OLA measuring device was calculating my ride time instead of my wait time. I did not know of it as these calculations were being made by a software that was running in the background. The template of the invoice, if you would notice would read out the charges as Wait Time which is correct however, the value reflected on the invoice which has been calculated by the software in the background is Ride Time. This incident has created serious doubt with regards to the reliability and trustworthiness of OLA’s billing practice. Through this blog, I wish to make people aware of the possibilities of glitches in the billing system of the online taxi service. Demand more transparency in the billing system and ensure everyone (reported or unreported) who has been overcharged by OLA is refunded the extra charge. OLA has no moral right to accumulate any revenue through billing errors due to fault in their system. Further, I would like to highlight a few things mentioned on the OLA website which I feel is truly amusing. On the homepage of Olacabs.com, they advertise themselves by claiming that all cars have been audited for safety and customers should be confident and assured of what they are being charged for. However, under Terms and Conditions OLA makes no representation or warranty that the services would be uninterrupted, timely, secure or error-free. OLA should refrain from advertising themselves for safety and reliable payment system if they cannot guarantee customers the same and compensate for it in case of failure. Moreover, according to the Terms and Conditions of OLA the customer must pay the taxi fare as displayed in the meter and makes no exception even if the fare being displayed is incorrect. the mechanism by which it calculates the distance travelled and wait time during a trip from pick up point to drop point. List the devices that are being used to track. How frequently these devices undergo maintenance. How accurate are the distance and wait time calculation. How much error is permissible in the reading from the devices and the actual. OLA should incorporate a feature that would allow the customers to keep a tab over the distance being covered and wait time on real time during the course of the trip. Another feature that suggests all possible routes between pick up point and drop point with traffic situation on the routes must also be incorporated. OLA should have a pro-active system in place that verifies the bill before charging the customer. an impartial and independent inquiry should be made to find how frequently did the OLA software encountered billing errors. How many customers have been refunded the extra charge? The number of billing errors that go unreported. The number of unreported billing errors that OLA has pro-actively settled by crediting the extra charge back to the customer. Identify customers who have not reported billing errors and are yet to receive a refund. As customers are we not entitled to a minimum service guarantee of a certain quality standard from the service provider? Shouldn’t the service provider be made accountable for the services they provide and fined appropriately if they fail on their part? Recently, OLA had come under criticism when an Engineer like me stumbled upon its unsecured Mobile App. and discovered that the API calls could be replayed to top up its wallet. OLA has fixed the glitch and issued a categorical statement in this regard. Questions have already been raised on responsible disclosure practices, especially in case of companies such as OLA that do not run a bug bounty program. The government, courts, regulatory authorities, consumer forums and consumer rights protection N.G.O.’s should take suo moto cognizance of lapses in the present billing system of OLA and other taxi services. Pressure must be created on OLA and others to make their billing process more transparent. For God Sake, OLA open up your system! *OLA CABS is yet to confirm or deny if the glitch was indeed present as I am suggesting in this blog. About the Author: Akshay Lahoti works as a Data Scientist at Dream11.com and has written about this on Ola Ka Gola blog. "Decoding OLA Cabs Billing Issues - Ola ka Gola! ", 5 out of 5 based on 1 ratings. I took an Ola ride today (when the banks just opened after the currency cancellation). The driver picked me up and after a few meters asked me if I am paying by cash or Ola money. I said by Ola money and he said he won’t be able to take me to my destination because he doesn’t have enough fuel. So, he would drop me off at the nearest junction; but if paid in cash, then he would drop me off at my destination. I was in a hurry, and hence agreed to pay in cash because I remembered reading some place that I had the option of either paying by cash or by Ola money balance. Also, has done so once in the past when they had a system glitch. At the destination on stopping the meter, I never got any messages from Ola about the total fare; but it was shown on the drivers device. This maybe because Ola is now sending push notifications, and not SMS as in the past, and I might have lost my data connection on the phone. So, I paid the driver in cash and he said my Ola money will not be deducted. However, on reaching back home, I get the notification and bill details for the return ride. And I was surprised to see that my Ola balance has been debited with fare for the previous ride as well. Called Ola with the complaint and they refused to entertain the complaint saying they would not be able to do anything! They said I should have called them with the complaint at the time of drop off. And that I have to deal with the driver directly in this matter. Well, how am I supposed to do so if I never got any notifications from them about the fare? It appears that the drivers are aware that this would be the position that Ola is taking and hence they can get away with this kind of cheating. I tried to call the driver a couple of times, and according to him he stays pretty close to my house. He was supposed to have come and dropped off the money in an hour or two. Has not shown up for almost 6 hours now and not answering the calls. I feel cheated by Ola because they fail to address such issues and let the drivers get away with this kind of cheating. Not sure how to handle this situation, but I have a strong feeling that I shouldn’t let the driver and company get away with this kind of daylight robbery. I might take it up with the authorities (even if it costs me much more than the actual monetary loss). Also, going to stop using them as soon as my Ola money balance is over. I am sure it is not going to make any difference to Ola, but will make a huge difference to me! So, my advice to people using Ola: if you must use them, always make sure that you say NO to Ola money. Why should your precious money be parked with them, instead of in your own bank account? If you are tempted to use Ola money due to their offers, then be careful and NEVER pay the drivers cash under ANY circumstance. ALWAYS use cash, or credit/debit cards; but beware of the possibility the drivers skimming your cars and Ola just washing their hands off! Yes, my loss was small, but the bitterness I feel at being cheated by a corporation in collution with their employee is pretty strong! This is an ongoing practice. I have observed and questions the drivers more than one occassion without satisfactory answer. As per my observation, any waits after the journey commences, where the driver reaches the zero speed is simply acumulated to get the wait time casuign your bill to go up unnecessarily. This is simply an unethical and malpractice. Thank you Mohak for signing my petition. Indeed good observation. Adding my experience here as well. I booked a OLA MINI and I received OLA MINI, however I was charged fares of OLA SEDAN. This seems like a cheap trick OLA is using to “Make hay while the Sun shines” – “Make most while the customer is not bothered as much”.. So for a 28Kms jouney that I took, I ended up paying 150 more each side of the journey…! hi myself driver in ola city Patiala Punjab.we have not received our sellery past 4 weeks.as local office holder commit us over the week payment diposet ur account.after 3 weeks we tried to contact them.they are not attend our calls.bcoz everybody thought its drivers fault.but nobody expected what is the reson.maybe thx. @Anaggh, I really think that these guys do it on purpose, make it complex so it will confuse people, and rather than paying attention, they will ignore something that they dont understand. All the while when companies like OLA fill their coffers. It’s a sad way to do business and it is worse that startups like OLA and others are doing it! Ola is doing this kind of fraud since long. They are forging the waiting time, and charging customers. Thanks that you have brought this issue with details. Actually the 10min free wait time is only applicable when the driver is waiting for you to board the car. Once you’ve boarded the car and the trip starts, the ?2/min waiting charge immediately kicks in. Ola does not clarify this fact properly in its website, where wait time charges for mini is displayed as Rs 2 per Min (Post 10 Min). It would be good if they correct it. So long post about technical glitche… What about different charges during peak time?